*Product was received for review. Frecklebox.com is a unique site where you can purchase truly special, one-of-a-kind personalized gifts for kids. Our growing selection of personalized kids’ gifts includes personalized books, coloring books, puzzles, posters, party favors, stickers, journal books, placemats, growth charts and more. For this review, Frecklebox allowed me to choose a selection of their personalized school supplies. There are so many adorable options to choose from including personalized lunch boxes, personalized school folders, personalized kid's notebooks...just to name a few!! What a tough choice!! You can mix and match to coordinate all your child's back to school gear and to make them 100% unique to your child's taste! Personally, I liked the idea of having everything match, but my little man had other plans and instead chose to add some variety. 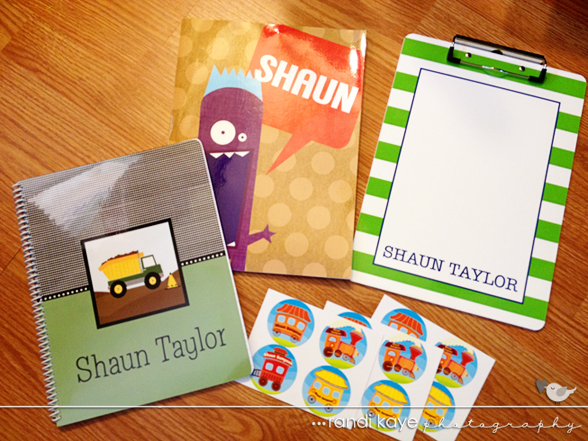 He chose the Purple People Eater Folder, Men at Work Notebook, Green Stripe Clipboard and Starline Train Stickers. The ordering process was extremely easy, and I loved that we were able to preview what each item would look like with whatever customization we chose! I have seen other similar websites that do not have this option, so it can be a bit of a guessing game as to how it will actually look so this was a plus...especially when showing Shaun! When they arrived, we found that they looked just exactly as they had in the previews as well!! To be honest, I expected there to be a bit of a wait time, as is the case with many personalized items. I was pleasantly surprised with how quickly they arrived- less than a week after the order had been placed! Their production is started after the order is placed, and complete within 48 hours, so no crazy wait times! When I order something online, I can be a little impatient waiting for it to arrive, so this is a definite plus!! Once they arrived, the first thing I noticed was the amazing quality! If I am going to pay $10 for a notebook, it better last! The quality of these notebooks is definitely a million times better than that of typical notebooks you'd buy at the store. Those notebooks don't stand a chance of surviving a year with my rough little man, but I have no doubts that this one will! The other items were great quality too- you're definitely getting your money's worth! And as an added bonus, they are eco-friendly- printed on recycled paper and made in the USA! But all that aside, we all know that the ultimate test is if the little one likes it, right? 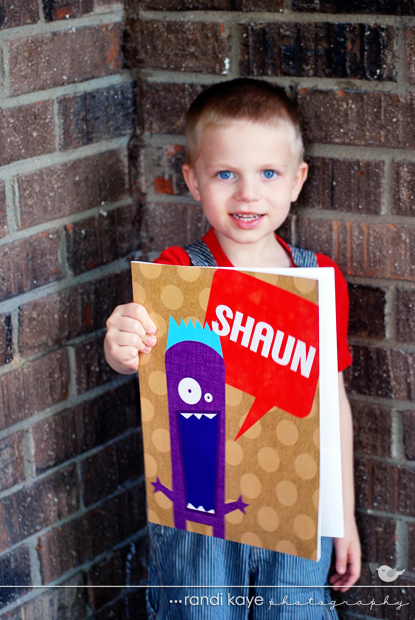 And this little man LOVED it all- especially his Purple People Eater folder! Like many kids, he loves anything with his name on it so these were just perfect for him...and because everything is custom made to say exactly what YOU want it to say, you don't have to worry about not being able to find your child's name or finding their name, but the wrong spelling! Though Shaun is not an unusual name- it does seem to be the least common spelling, so we often find 'Sean' or 'Shawn', but not 'Shaun'! When I was a kid, I NEVER was able to have anything with my name on it...unless I wanted it spelled 'Randy'...and of course then they would be boy-ish! Likewise, I know that we will have a hard time finding anything with 'Finley' on it once baby arrives! Needless to say, this complete personalization from Frecklebox is a huge selling point for me, and if you have a little one with an uncommon name, I'm sure they will appreciate it as well! They can finally have their own custom made back to school goodies too! But Frecklebox isn't just for back to school! They offer great gifts throughout the year- holidays, birthdays, just because...they offer a wide selection of personalized gifts for kids including coloring books, coin banks, growth charts, chore charts and so much more! Truly a little something fun for every child on your list! They even offer custom wrapping paper which I think is a super fun idea for the holidays! 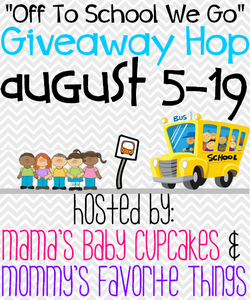 Since you've entered my giveaway, be sure to stop by the Grand Prize for your chance to win a $100 Gift Card from Gymboree clothing, a $30 Gift Code to Frecklebox for school supplies, and a $75 Roller Backpack from J World! Open to US only. And don't forget to hop along to all these other great blogs to enter their giveaways too!! I might get the All Star Yubo Lunch Box - Blue. I would get personalized placemats for my 3 kids. I would get my son some personalized notebooks. I would get my son some personalized notebooks and a clipboard. I would get their Sight Word Pad, Kindergarten 1 to help my daughter with kindergarten this year. Definitely a cool binder for my 6th grade granddaughter. I'd get All American stickers. a rev it up coloring book! I would get some personalized notebooks or a Personalized Coin Bank! The Dancing Pigs are too cute! I would get a black plaid placemat. i'd get a piggy bank!